InFocus IN8606HD review | What Hi-Fi? 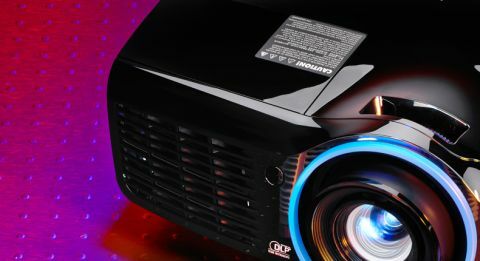 With its big picture, compact design and affordable price, the IN8606HD is worth considering if you’re taking the first step towards a home cinema package. With Full HD and 3D credentials, the InFocus delivers a large, bright picture. Pirates Of The Caribbean: At World’s End on Blu-ray shows a good level of detail coupled to low levels of noise and decent contrast in scenes that combine bright and dark elements in a single frame. The grimy woodwork and torn sails on the Black Pearl, the details on the period clothing and the wrinkles on faces – all are etched out admirably. The colour balance is a touch understated but is none the worse for that, looking convincing with skin-tones. Black levels, on the other hand, are pleasingly dark. They may swallow up finer detail, but they give low-light scenes a nice sense of depth. There’s a hint of instability around moving objects, but not enough to annoy or distract you during a film - even in 3D. Life Of Pi looks relatively smooth and there’s a pleasing sense of depth, even if the picture is dimmed. It’s comfortable to watch. The active-shutter 3D glasses, on the other hand, are chunky and grip just a little too tightly for our liking. They don’t come bundled either, costing around £50. But at least they stay on the head and have a comfortable nose bridge. We wish the IN8606HD was more successful when it comes to upscaling DVDs. The picture looks a little patchy around the edges and lacks detail. We’d stick with Blu-rays. The IN8606HD has built-in speakers, but don’t expect fully-fledged surround sound. The sound is thin, and voices aren’t fleshed out enough for our liking. A budget 5.1 speaker package should be on your shopping list if you want all the punch and pizzazz of a movie’s soundtrack to come across as it should. The build of the IN8606HD is solid and sturdy, yet it’s also compact enough to position easily in your room. The all-black finish is broken only by a bright blue ring around the lens, giving it a distinctive look. The remote, on the other hand, is of a flimsy credit-card style that’s very fiddly to use. It’s far too small and impractical to use, especially in the dark. And it wouldn’t be wise to lose it – apart from manual zoom and focus, there are no other controls on the projector itself. The InFocus comes equipped with a generous helping of connections. There are two HDMI inputs – handy if you want to keep two different sources plugged in at all times, such as a Blu-ray player and a games console. Analogue sources are well catered for, with component, composite, S-Video and 3.5mm inputs neatly arranged on the back panel. You’ll also find single 3.5mm jacks for audio input and output, and a PC input for connecting laptops. There’s plenty to like about the InFocus IN8606HD. The breadth of connectivity on offer is appreciated, as is the compact design. A better remote would help, as would more controls on the projector itself. This InFocus has just enough detail, punch and conviction in its colour palette to make it an enjoyable watch - but not quite enough to be class leading.